SAHAHUHY 12 led stage lights, offer you colorful life,Change your life. DJ club, Live Show,stage decoration,dancing ball and other ceremonies. With DMX 512 and sound control technologies,this 12 led stage light offer you various possibilities: adjustable brightness, flashing effect, sound mode. DMX par lights come with double handles,can be self-supporting, can be hung, more conveniently. These 12 par lights shoots out colorful brightness moving with the music.What a beautiful scene? Facing with florid lights and the beautiful song, all bad mood would be moved away. ▶▶▶STROBE EFFECTS. Strobe effects, Red, Green,White and Blue colors change.The LED Par Light changes by Sound active mode,DMX mode,Master-Slave mode and Auto-Play mode. Perfect for up lighting, dance floor lighting, led stage lighting,Par Lights,architectural work and installs as well.You can control the change of the lights by DMX,Action Button or Remote Control and They could be programmed for just one color which you want! ▶▶▶LONG WORKING LIFE & STABILITY & EXQUISITE APPEARANCE.The stage up lighting have Long working life, excellent stability and Exquisite Exquisite Plastic Housing.Perfect for wedding Birthday Party Bar Club dace hall concert Home Ceremony Ballroom Christmas Halloween Festival.Bring you unique charm of stage, create a new world of music to you. 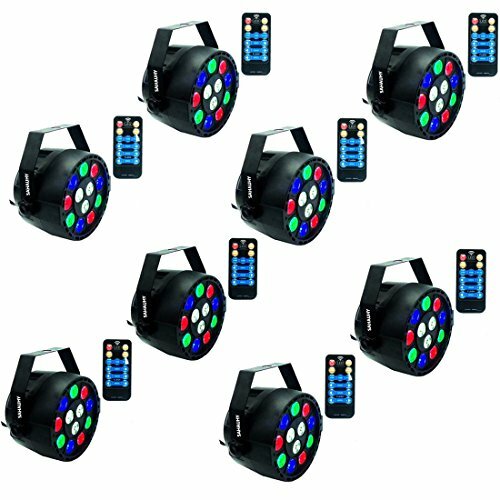 ▶▶▶MULTIPLE CONTROL MODES:Sound active mode,DMX mode, Master-Slave mode and Auto-Play mode.Control rotation speed, colors and strobe.High power 7 channel,6Leds(RED 3+ GREEN 3 +BLUE 3 +WHITE 3).Built-in sound active programs that perform full RGBW color mixing and chasing for an incredible light show.Have them and change your life! ▶▶▶VERY BRIGHT & POWERFUL.Use the latest LED technology,safety,energy efficiency and durability.Its light spot on the wall, the effect likes glass ball, very bright and powerful. Provides spectacular brightness,vibrant colors.Both professional Dj fans and non-professional person could use it without any pressure. If you have any questions about this product by SAHAUHY, contact us by completing and submitting the form below. If you are looking for a specif part number, please include it with your message.